You can imagine if you are using windows 10 and suddenly when you select more than 15 files some context menu items will be missing, e.g the Open, Edit, Print menu will actually be missing when more than 15 files are selected. Why was this? because Microsoft is trying to limit the number operations you can run at a time to avoid your system from showing not responding behaviour, because if you open or edit more than 15 files at a time, there is a likely tendency that the system will start showing not responding or even freeze which is actually not good for the system. In this tutorial we can see how can increase to number from 15 to whatever you like so that you can open them at a time more especially if its pictures. But i can still recommend not to run this kind of batch operations at a given time because it will incapacitate your windows and system. Create a 32-bit DWORD value named MultipleInvokePromptMinimum. 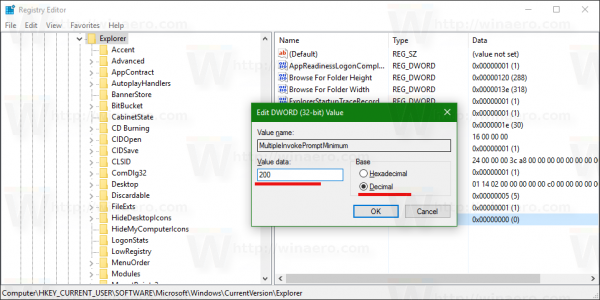 Set its value data in decimals to the number of items in Explorer for which you wish to have commands like Open, Edit, or Print visible. In the example below, I set the DWORD value data to 200 in decimals, so context menu commands will remain accessible for up to 200 selected files.